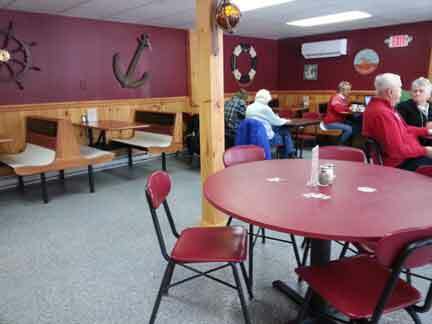 I have been to Riley’s Fish House in St. Johnsbury a few times, but always in the summer. This is one of my favorite places when I’m in the area because I am a seafood junkie. I also love their outdoor space. Though my son is older now, it was nice that there was a place for him to run around when he was little – meaning the adults could talk without him fidgeting. He was happy, we were happy – it was a win-win. A few weeks ago I went for the first time in winter. And it is the only traditional, New England “fish house” for miles. I was pleasantly surprised by the amount of seating because it looks like it would be a small space from the front. It is a very casual restaurant. Orders are taken at the counter, and if you’re indoors they are brought to your table on a tray, or your number is called if you sit outside. There were 5 of us, and we deliberated over the many choices on the menu. 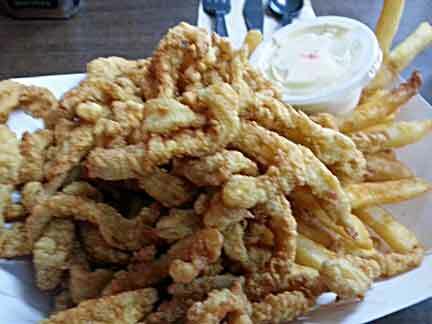 I finally settled on the clam strip “lighter plate”, my son got the fried scallops from the same lighter menu, and our table mates decided on 2 orders of fried shrimp, and a fish-and-chips. There was a bit of a wait even though it wasn’t very busy. We were told that everything is fresh so it takes a bit longer to prep and cook. Served in the traditional New England fish house paper trays, fries and seafood were almost spilling out. For less than $7, I ended up with a mess of clams, and my son’s order came with 10 scallops. I have to say, that is more seafood than comes in many dinner orders at most diners, for a better price, and the quality couldn’t be beat. I was also very happy with the fries. Normally when ordering seafood the order is 70% French fries, and I never eat more than half. That was not the case here. There was a decent amount of fries, but no one at the table had to throw them away. 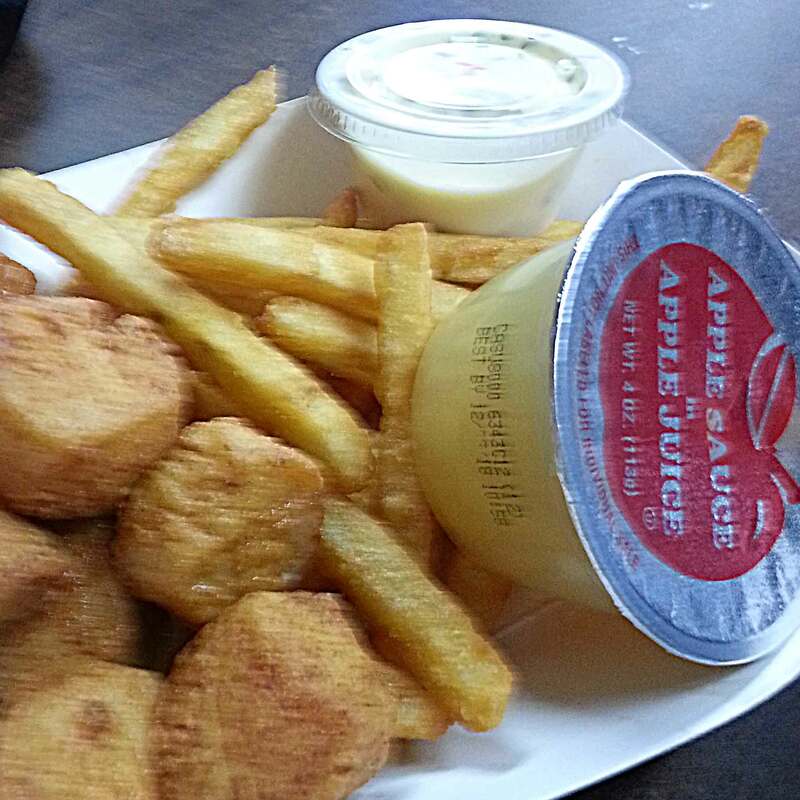 Because we all ordered meals, there was a choice of cottage cheese, coleslaw, or apple sauce as well. Now for the food – Nothing was Overcooked! For seafood, this is a difficult thing to accomplish. My clam strips were not the chewy rubber bands I have gotten at many a snack bar. These were large, plump, and cooked perfectly. They were salted well, and had good flavor. I snagged one of my son’s scallops, and these were great too. The outside was crispy, but the scallop inside was juicy and soft. Our table got fairly quiet as we consumed our meals, doing a little sharing along the way (I tried the shrimp too – they were well cooked, though not as flavorful as the other meals. This could have been because of the season and what is available for shrimp). We finished up with ice cream. They have a great selection, and a number of other treats. My son got a milk shake, but there were blizzards, an apple crisp, and a few other choices. Overall, I was happy with my first indoor experience at Riley’s. I will say I do prefer the outdoor experience. The outdoor eating area is very cute – with a covered area draped in netting and nautical items. The indoor décor is a little lack luster. The tables are older booths, banquet tables, and mismatched chairs. But, in no way does that detract from the food experience. I recommend trying Riley’s Fish House. You won’t be disappointed, and I bet it becomes a frequent stop on your St. Jay travels.